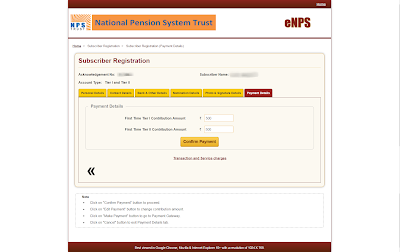 With the recent announcement of additional income tax benefits, government pension scheme named National Pension Scheme(NPS) is getting more popularity. Since it is linked to equity, chances of getting returns higher than that of Public Provident Fund(PPF) is high, past years performance proves this theory. If you are looking for income tax benefits, Rs.1,50,000 deduction is allowed under section 80CCD(1) and Rs.50,000 as per section 80CCD(1b). Interested? 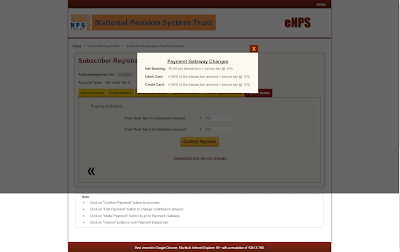 Just follow the steps given below, you can open an NPS account in just 10 minutes! Step#1: Navigate to https://enps.nsdl.com/eNPS/ and click on "REGISTRATION" link. 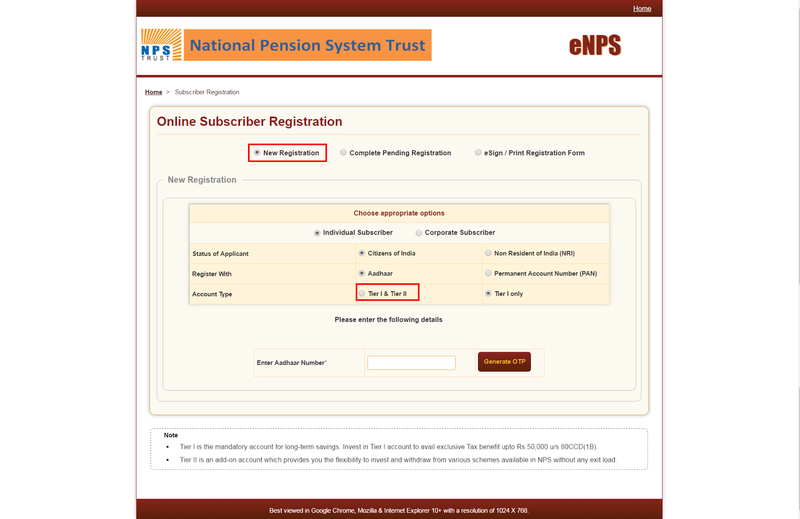 Step#2: Select "New Registration" then "Individual Subscriber". 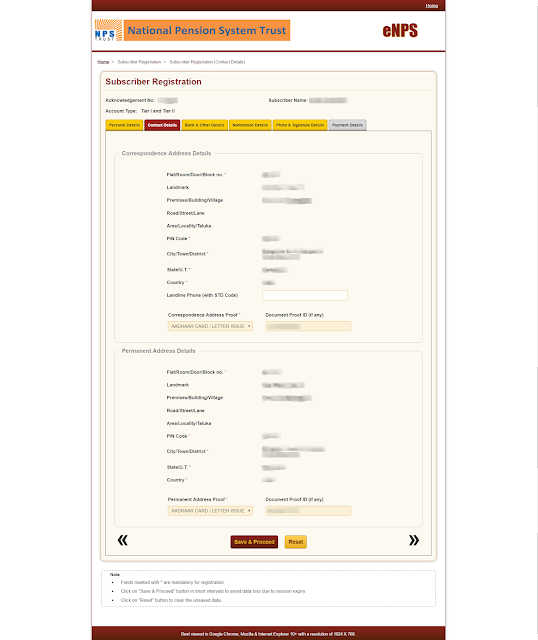 You can register with "Aadhaar" or "PAN", let's do it with Aadhaar which is the easiest option as your photo and contact details will get populated from Aadhaar database. Select Account Type as "Tier I & Tier II". Tier II is like a savings account, you can contribute and withdraw money n number of times, there is no additional charge for this. You must deposit a minimum of Rs. 500 in a financial year. Enter your Aadhaar number and click on "Generate OTP". Enter the OTP received in your mobile(registered with Aadhaar) and click next. Step#3: You can see your personal details populated already, add/update details as needed and click on "Continue Registration". Step#4: Add/update your contact details and click on "Save & Proceed". Step#5: Fill in "Other details" section. Next is the bank details, carefully enter your bank details and click on "Save & Proceed". Step#6: Here select your preferred scheme and investment option. If you are not a stock market expert, choose "Auto" and "Moderate" as investment option. Do the same for Tier II account as well. 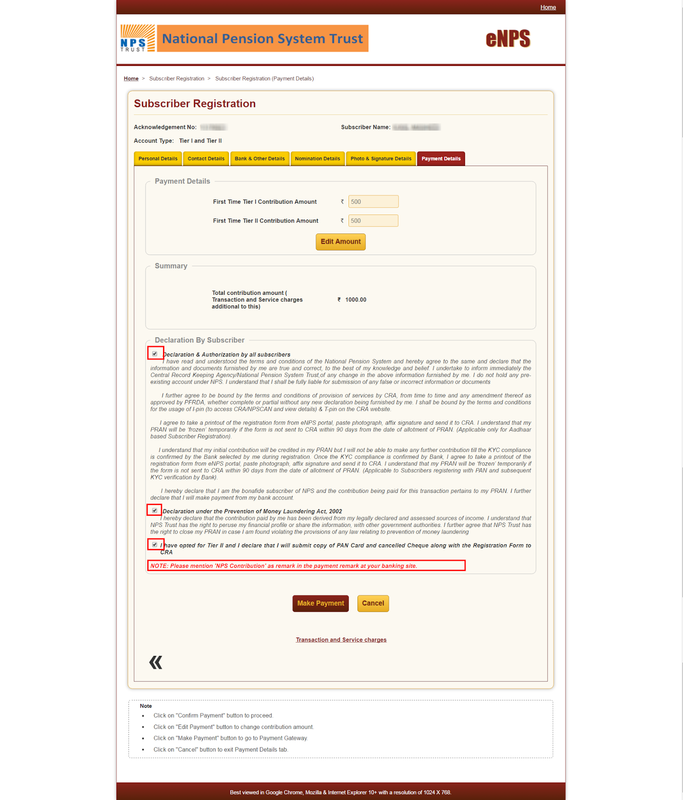 Provide nominee details and click on "Save & Proceed". Step#7: Here you need to upload your photo and signature. Each should be less than 12KB in size, use Paint or Photoshop to reduce the size. Once done, click on "Confirm". 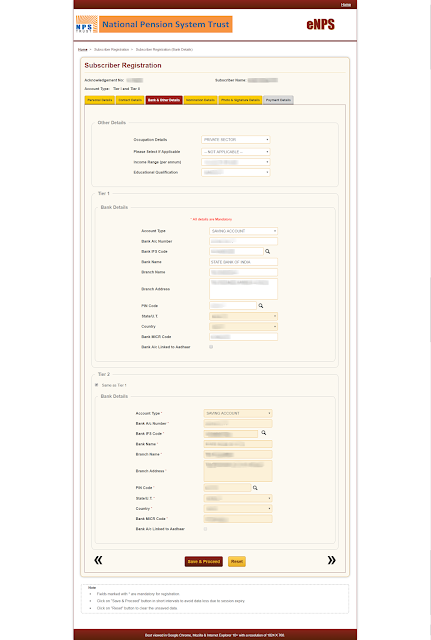 Step#8: Preview the details and if everything is OK, continue to payment section. 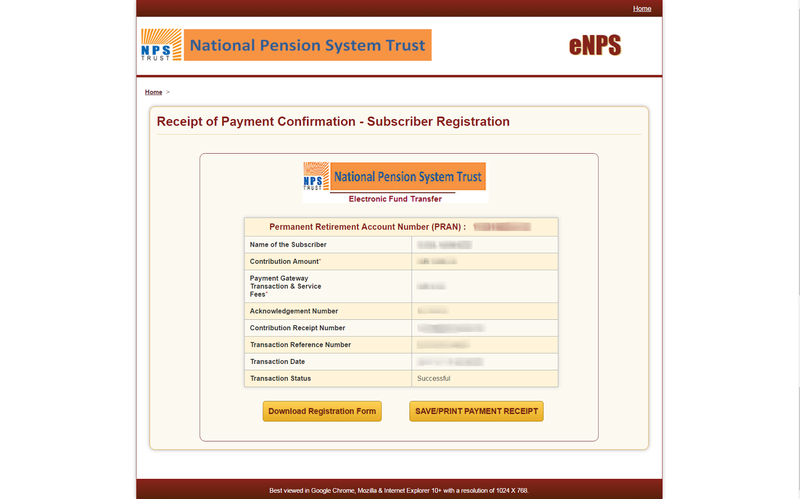 Step#9: Enter how much you want to contribute in each tier and click on "Confirm Payment". Please note you need to make a minimum of Rs. 500 in Tier I and Rs. 1000 in Tier II while opening the account. Also you need to make a minimum of Rs. 6000 to Tier I and Rs. 2000(balance) to Tier II in a financial year. There is a transaction fee for making the payment online, net banking is the cheapest option, Rs. 0.60 + service tax. Step#10: Accept the declaration and click on "Make Payment". 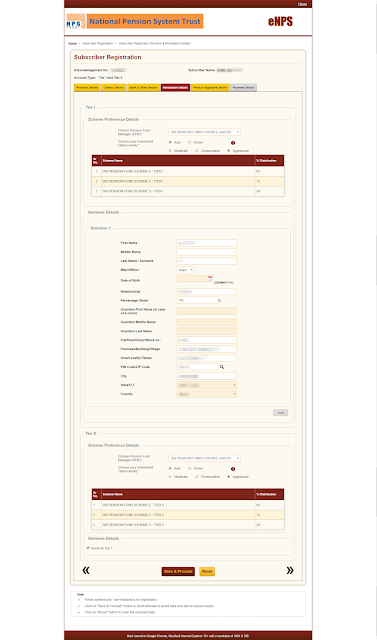 You will be redirected to the payment gateway, make the payment via your desired payment method. Step#11: On successful payment you will be presented with a screen where you can print/download the receipt. You can use it while filing income tax returns. Also download the registration form, affix a passport size photo, sign it and send it to the address mentioned in the form within 90 days. 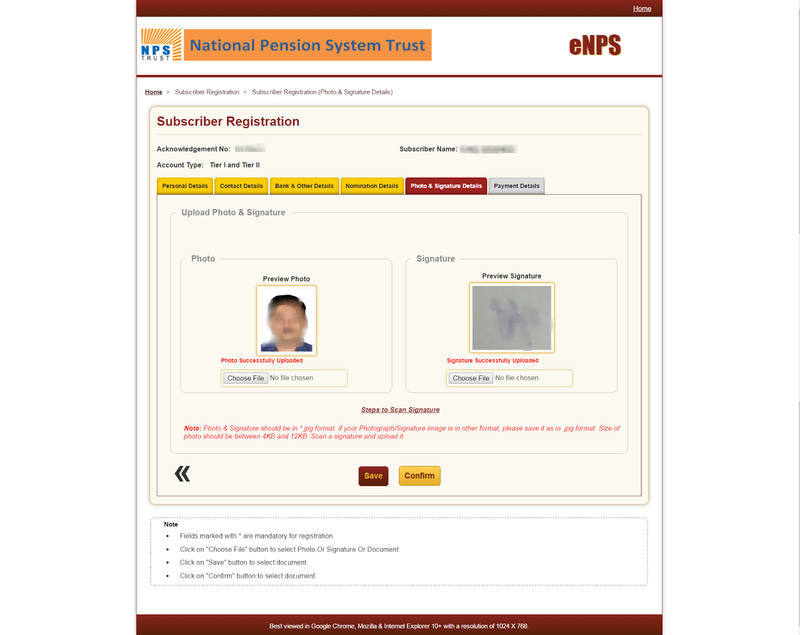 You will receive the NPS welcome kit within 1-2 weeks of filing the application. You can make additional contributions by going to the above link. 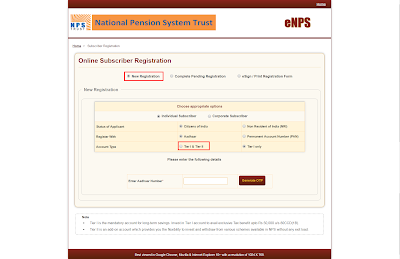 Just provide your PRAN number received in your email and your date of birth to authenticate yourself. 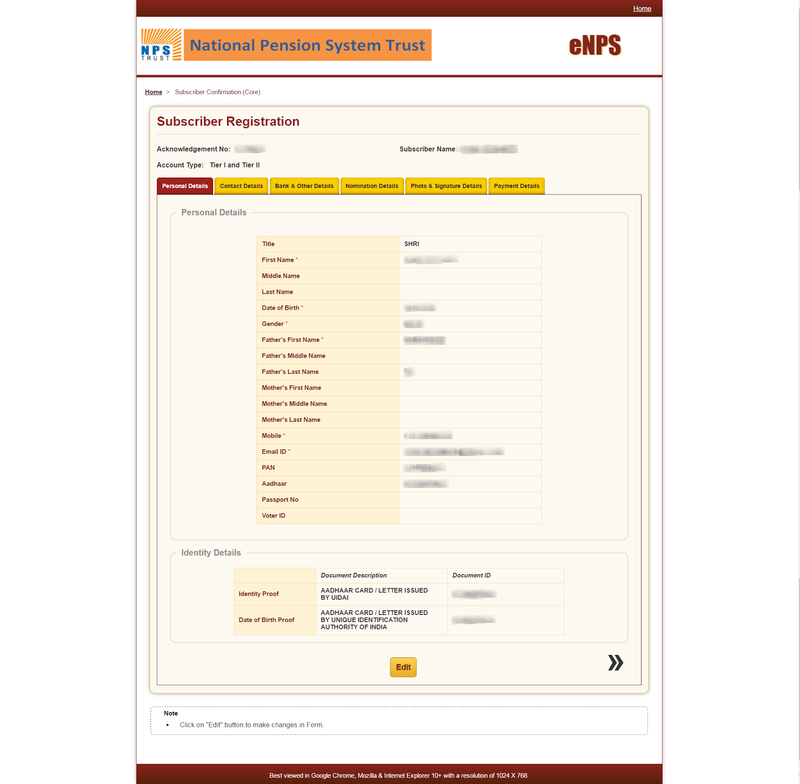 After successful registration, you will receive an email asking you to setup your IPIN and TPIN, follow the instructions and setup your PIN. Once your IPIN is setup, you can view your account details on https://cra-nsdl.com/CRA/. That's it, you are now a proud NPS account holder!! !